Next year features an anomaly for American Jews – The first day of Hanukkah coincides with Thanksgiving, on 11/28/2013 (meaning the first night of Hanukkah is actually the night before Thanksgiving). I was curious how often this happens. It turns out that it has never happened before...and it will never happen again. Thanksgiving is set as the fourth Thursday in November, meaning the latest it can be is 11/28. 11/28 is also the earliest Hanukkah can be. 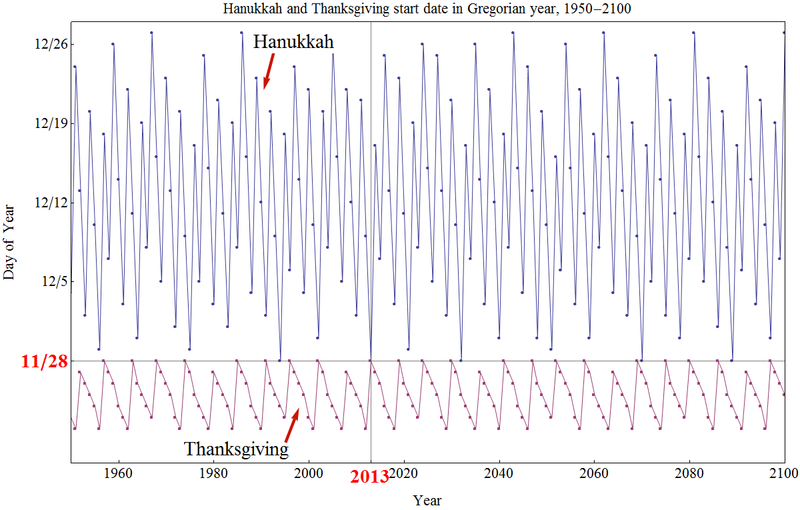 The Jewish calendar repeats on a 19 year cycle, and Thanksgiving repeats on a 7 year cycle. You would therefore expect them to coincide roughly every 19x7 = 133 years. Looking back, this is approximately correct – the last time it would have happened is 1861. However, Thanksgiving was only formally established by President Lincoln in 1863. So, it has never happened before. Why won't it ever happen again? Of course, if the Jewish calendar is never modified in any way, then it will slowly move forward through the Gregorian calendar, until it loops all the way back to where it is now. 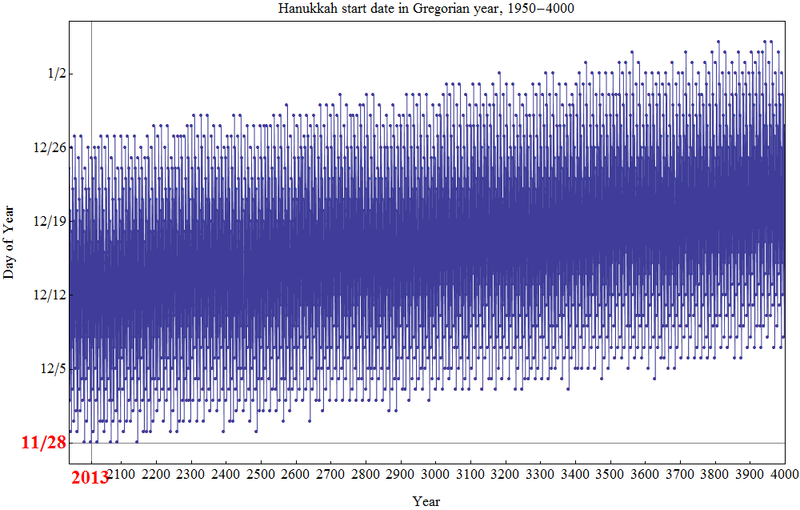 So, Hanukkah will again fall on Thursday, 11/28...in the year 79811. Update 1/16/2013: In response to numerous questions and comments, I've posted an addendum below. 1) A "day" in the Jewish calendar starts at night. This leads to an inherent ambiguity when talking about Jewish calendar days overlapping Gregorian calendar days, because each Jewish calendar day actually starts on the previous Gregorian calendar day. This means that although this coming year the first day of Hanukkah falls on Thanksgiving, candles will be lit for the first NIGHT of Hanukkah the night BEFORE Thanksgiving. 2) Related to (1), when the first day of Hanukkah falls the day after Thanksgiving, the first night's candles are lit the night OF Thanksgiving. This will happen two more times, in 2070 and 2165. 3) The 79811 date is accurate, but was meant to be tongue in cheek. But, as a few people pointed out, Jewish law requires Passover to be in the spring. Therefore, the Jewish calendar will have to be adjusted long before it loops all the way around. 4) For the real nitpickers, it is also true that it is not necessary for Hanukkah to to get all the way back to Thursday, November 28 to hit Thanksgiving again. The actual next time the two will overlap is when the LAST day of Hanukkah falls on the earliest Thanksgiving date, which is in 76695. In all honesty, though, all of these dates are unfathomably far in the future, which was really the point. 5) I was considering here Thanksgiving to be the fourth Thursday in November, which is what it currently is. However, originally it was the LAST Thursday in November. This changed in 1942. If you use the last Thursday rather than the fourth Thursday, then the overlap has happened once before, in 1888. There were also various inconsistent dates for Thanksgiving going back centuries, which I did not consider. 6) These calculations were all done in Mathematica.